I was inspired to make homemade pierogies yesterday and enlisted John as the filling-maker, while I played with the dough. We’d never made them before so we browsed through John’s “New York Cookbook” which had a couple of recipes. We took ideas from each of them, depending on what ingredients we had on hand. If this is any kind of testimonial, they tasted almost EXACTLY like the Mrs. T’s Pierogies you can get in the freezer section at your local grocery store, only better, so we must have done something ‘right’ – LOL. Mix these dumpling ingredients together to make the dough. Then, knead the dough until you reach a pizza dough-like consistency, then form into a ball. Let sit for an hour, then refrigerate for about a half-hour, covered. Peel, cube and boil the potatoes until soft. While the potatoes are cooking, chop the onion and blanch until clear. Then add the minced garlic and continue to blanch until blended. Set aside. Mash the potatoes in the saucepan with a manual masher. Add onion and garlic to the potatoes and then mix until well blended. Add salt and black pepper to taste. Roll out the dumpling dough to about 1/8″ thickness. Cut into rounds (such as with a biscuit cutter) that are about 2 1/2 inches in diameter. Place about a half teaspoon (depending on the size of the cutout) of filling on the circle of dough. 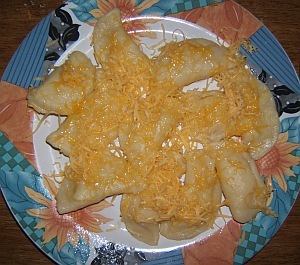 Sprinkle a bit of the shredded cheese on the filling. Fold the dough in half and pinch the edges shut firmly with your fingertips. Continue until all dough is gone. Bring a good amount of water in a large saucepan to a boil. Reduce heat to a simmer. Add about 10-15 dumplings at a time (not too crowded) – they will sink at first and then float as they cook further. They will take about 8 minutes, or longer if you made the dough thicker than recommended. When done, pull them from the water with a slotted spoon. Continue with this process until all the dumplings are cooked, keeping the cooked ones warm in the meantime. For serving, sprinkle more grated extra sharp cheese on top. Another option is to fry the cooked pierogies in a frying pan with a bit of oil/butter in the bottom, until somewhat brown and crispy. Note: These are best when eaten promptly. The garlic flavors will fade overnight – I guess it’s a garlic and potato thing? Anyway, they’ll still taste good a day later, but not as garlicky.